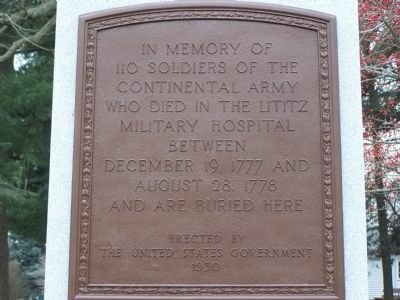 Who died in the Lititz Military Hospital between December 19, 1777 and August 28, 1778 and are buried here. Erected 1930 by The United States Government. Location. 40° 9.294′ N, 76° 17.673′ W. Marker is in Lititz, Pennsylvania, in Lancaster County. Marker is at the intersection of E. Main Street and Elm Street, on the right on E. Main Street. Touch for map. 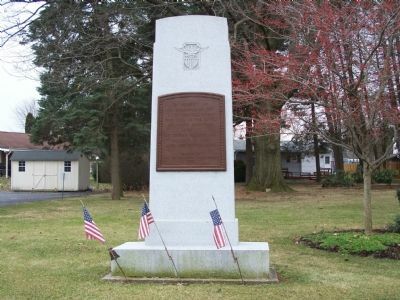 Marker is in this post office area: Lititz PA 17543, United States of America. Touch for directions. Other nearby markers. At least 8 other markers are within walking distance of this marker. Revolutionary War Memorial 1930 Veterans Memorial 1999 (a few steps from this marker); In Grateful Recognition to All Veterans (a few steps from this marker); Moravian Gemeinhaus (within shouting distance of this marker); On This Site in 1861 Julius Sturgis (approx. 0.4 miles away); Linden Hall (approx. 0.4 miles away); John Augustus Sutter Memorial (approx. 0.4 miles away); Lititz Moravian Congregation (approx. 0.4 miles away); The Heritage Center (approx. 0.4 miles away). Touch for a list and map of all markers in Lititz. 2. Full view of monument. More. 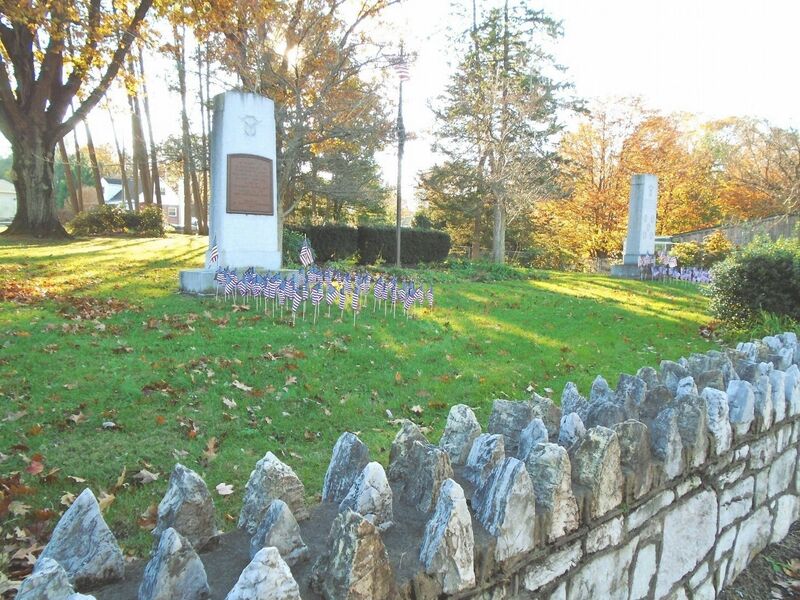 Search the internet for In Memory of 110 Soldiers of the Continental Army. Credits. This page was last revised on November 11, 2018. This page originally submitted on February 9, 2008, by Bill Pfingsten of Bel Air, Maryland. This page has been viewed 1,209 times since then and 8 times this year. Photos: 1, 2. submitted on February 9, 2008, by Bill Pfingsten of Bel Air, Maryland. 3. submitted on November 11, 2018, by William Fischer, Jr. of Scranton, Pennsylvania.